Specialist Mobiles - Who Needs Them? Why Buy a Waterproof Phone? Why Buy a Survival Phone? For a certain segment of the population a survival phone just makes sense. 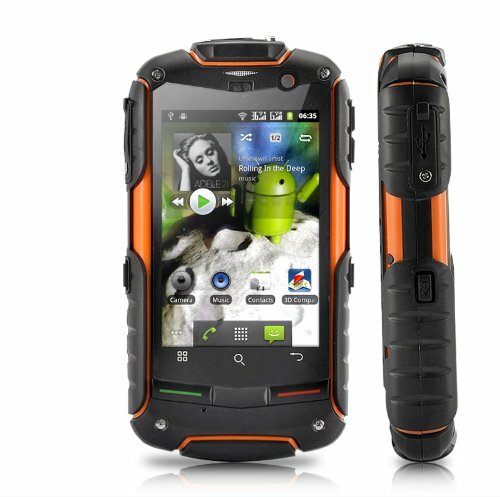 These phones are specifically designed to be rugged and survive pretty much anything. They tend to be waterproof, shock proof, shatter proof and scratch proof too. And for people that need to take their phones outdoors these qualities can be tremendously important. Maybe you like mountaineering or kayaking. You'll want a dependable phone to take with you in case there's an emergency, but you can hardly take your iPhone out into the mountains. A rugged phone will survive being dropped, even been hit and generally beaten up. And it will give you the security and peace of mind of knowing that you can call for help if necessary. Rugged phones used to be low featured and clunky, but most of the more modern incarnations are regular smart phones that happen to be extra durable. When buying a survival phone you should look for an IP rating. This will be the letters IP followed by two numbers. The first number will range from one to six, and will tell you how dust proof the phone is with the higher numbers being better. The second number will range from one to nine and will tell you how waterproof the phone is, with higher numbers again being better. Why Buy a Dual SIM Phone? A dual SIM phone is exactly what it sounds like, a phone that allows you to simultaneously run two SIM cards. More and more people are buying dual SIM phones, and the have a surprising number of advantages. If you're required to have two phone numbers, say a business and a personal number, then a dual SIM phone will allow you to have both those numbers on the same device, meaning you don't need to pay for or to carry two separate phones. If you travel frequently to another country, you'll find that it's far cheaper to buy a local SIM card than it is to use your home mobile on roaming. A dual SIM phone lets you run your foreign SIM card for cheaper rates, whilst still letting you get all your calls and texts from home. Even if you're only going on holiday, if you'll be in a country for more than a couple of weeks, you'll probably save money getting a cheap, local pay as you go SIM card. Finally, many people are using dual SIM mobiles to get savings on their mobile phone bills. Different operators have different prices on services, and some are cheaper than others. For example, you'll probably find that Three has great prices on mobile data, but their prices for calling minutes are higher than average. Vodafone, on the other hand has pretty expensive mobile data prices, but cheap calling minutes. So you get a SIM card and mobile data plan from Three, and a SIM card and calling minutes from Vodafone. Put both cards into your dual SIM phone and you can get lower monthly mobile bills. Combining the cheapest services from different operators can get you big savings, but you'll need a dual SIM phone to take advantage of this. Why Buy an Emergency Phone? Emergency phones are designed with a very specific target audience in mind. These phones are usually very basic. They're easy to use, have large type on screen and large physical numeric keypads on the front. They also generally have one large button on the back of the phone. This rear button will connect directly to the emergency services when it's pressed. These emergency phones are directed towards older users, people who need to be in constant contact but aren't technically savvy enough to make use of a regular smart phone. These users are also people who, maybe for health reasons, will get a lot of peace of mind from the ability to contact the emergency services at the touch of a button. A small segment of the emergency phone market is directed towards small children. Children's phones tend to have only one button, which is pre-programmed to a certain number, generally the parent's mobile phone or home phone, allowing even the smallest child to call mum if necessary. These mobile make great buys for either elderly parent or grandparents or small children.